Couple friends were still fighting Horde out in Hillsbrad at the plants and zombie mini-game, so I headed out to help them. 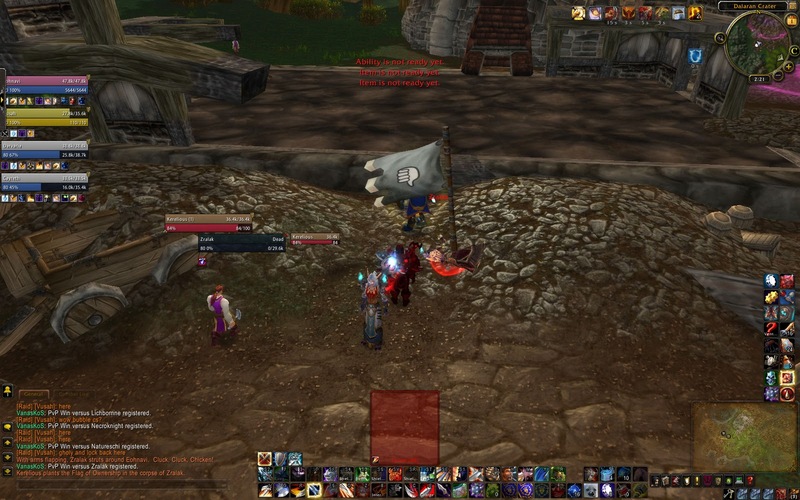 We ended up camping the questgiver ourselves for a bit, scattering the Horde that showed up. Nothing worth elaborating on. Finally 7 of Reckoning Day’s finest showed up and wiped us. Repeatedly. We did manage to get 2 or 3 of theirs each time, so it wasn’t a total pounding. We stayed when we probably should have left, but it was still pretty fun. Once we finally got more heading out to us, they took the first portal outta dodge before we could even summon them. After that we pretty much just continued camping the quest area. I tried killing some Horde characters at a nearby city to see if anyone would respond, but nobody ever did. Dueled, killed Horde, played a few rounds of the zombie game, but nothing significant happened. Blah, blah, blah, etcetera. Participants: Bold denotes level 80, * indicates more present than accounted for. Just trying to pay respects to the guild using a little figurative speech. You guys can duke it out for top dog I guess. I’m sure Detharsenal will be glad to oblige with a PvP event! Previous story PvP happened, and I pretty much just watched.